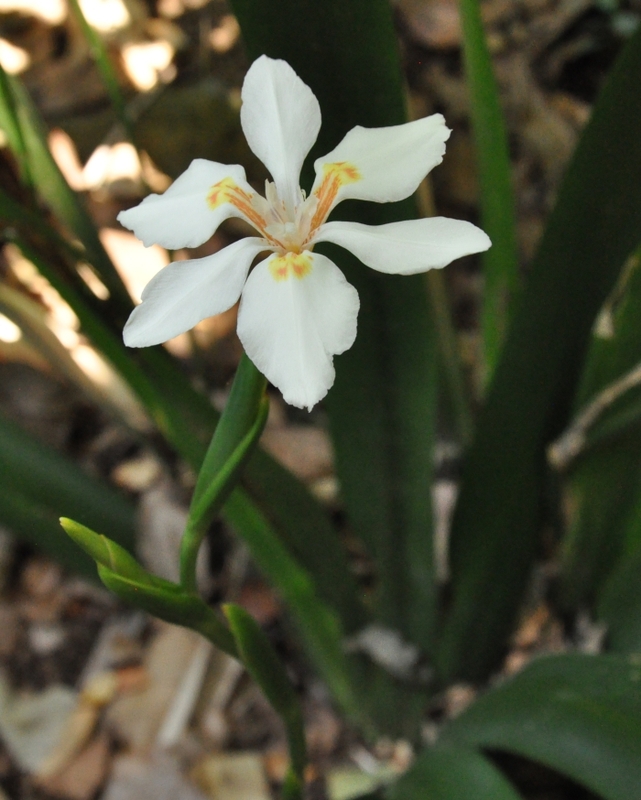 Dietes butcheriana is an indigenous, shade-loving, evergreen irid with broad leaves arranged in a fan, and large, white flowers with apricot markings, in spring and summer; it grows wild in the forests of eastern South Africa. Dietes butcheriana is an evergreen, clump-forming perennial, 0.5–1.2 m tall, with a rhizomatous rootstock (rhizomes are modified stems that are below the soil surface). It has broad, sword-shaped, leathery, erect leaves, 25–50 mm wide that are arranged in an attractive fan-shape, dark green and have a central vein. The flowers are large, up to 60 mm in diameter, white with yellow and orange markings. They are produced sporadically on a sturdy, branched stem that is shorter than the leaves, in spring and early summer (Sept. to Dec.), but are seldom seen because they open late in the afternoon and fade early in the evening. 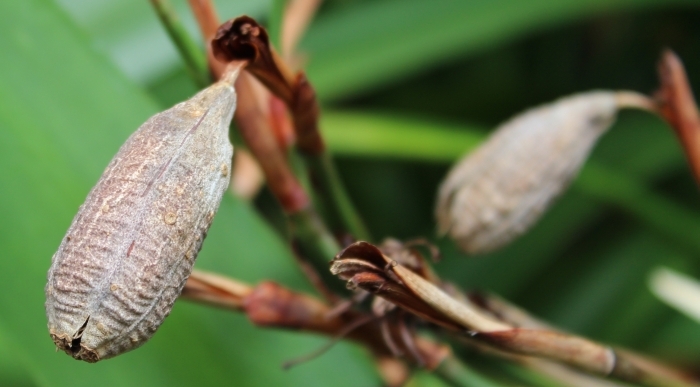 Seed capsules are large, 25–35 × 20 mm, nodding or pendent when mature, and they do not split open, except near the tip, but remain attached to the flowering stem for months after ripening. Black seeds are shed as the capsule disintegrates. 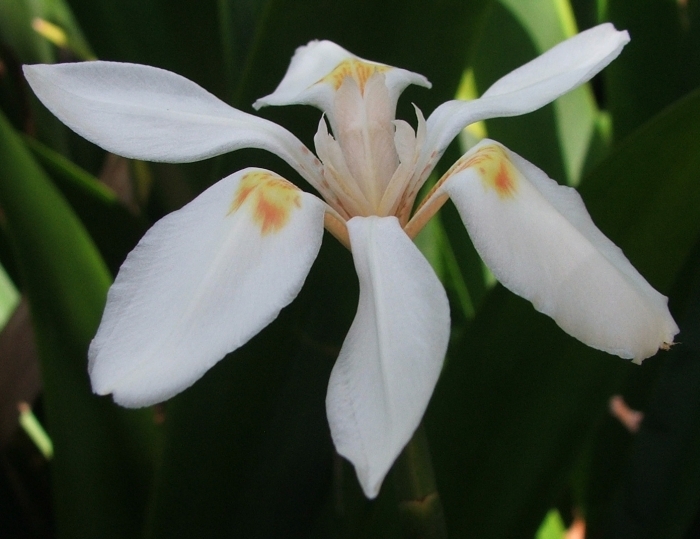 This species can be distinguished from other species of Dietes by its broad leaves and large seed capsules, which are almost always found on the plants. Also, the flower does not have any violet colouration on the style branches, as is seen in the flowers of D. grandiflora and often in D. iridoides. Dietes butcheriana is not threatened and is assessed as Least Concern (LC) according to the Red List of South African plants. It was previously classified as Rare when it was thought to be confined to mistbelt forest of KwaZulu-Natal, but it is now known to occur over a wider area. 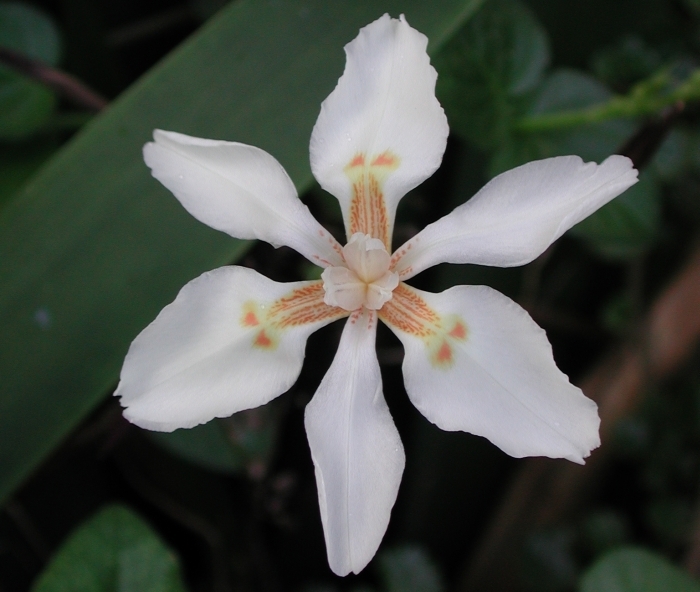 Dietes butcheriana is endemic to South Africa, where it occurs in deep shade on the forest floor, on steep shady slopes, and on forest margins, in mistbelt forest of KwaZulu-Natal and in coastal forest and forest in the Eastern Cape. The genus name Dietes is derived from the Greek dis, meaning ‘twice’, and etes, meaning ‘an associate’ and means ‘having two relatives’ referring to its position between its two closest relatives Moraea and Iris. 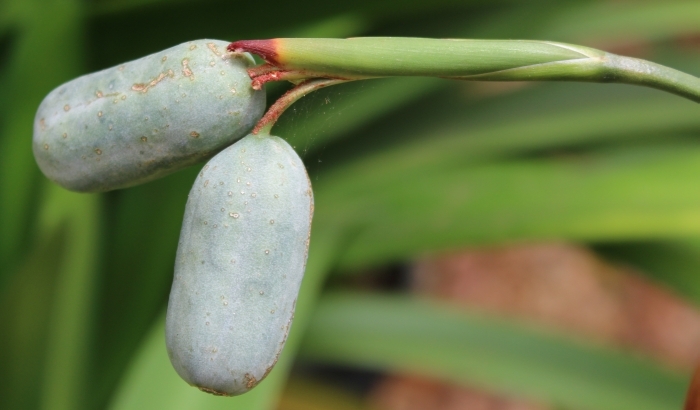 This species is named for Harry James Butcher (1866–1950), a merchant from Durban, who gardened with South African plants and discovered this species. All the Dietes were once called Moraea because of their close relationship, but were separated because Dietes have a rhizome and Moraea have a corm. Dietes is a small genus of 6 species. There are 5 species in South Africa: D. bicolor, D. flavida, D. iridoides, D. grandiflora and D. butcheriana, of which only D. iridoides occurs outside of southern Africa, being found from the Western Cape to Tanzania, Kenya and Uganda. The sixth species, D. robinsoniana, occurs on Lord Howe Island in Australasia. This plant is evergreen and shade-loving, adapted to growing on the forest floor in deep shade to partial shade conditions. The flowers are self-fertile, forming capsules without the need for pollinators. The flowers are extremely short-lived, lasting just a few hours. Dietes butcheriana is used in traditional medicine. Mixtures made from the inner part of the rhizome are used to treat dysentery. Rhizomes are used during childbirth. Roots are used for first menstruation. Leaves are used for female ailments. Some families believe that if you have been to a funeral, the rhizome must be chewed and spat on the ground to take the bad luck away. Plants may also be burnt to purify a homestead. The fibres in the leaves are used to make string. Dietes butcheriana is not well known in horticulture, but is a worthwhile garden subject. It is not as free flowering as D. grandiflora, and is valued more for its attractive fan of broad leaves. It is well suited to shady gardens and will thrive even in deep shade, performing best in a warm, frost-free climate in fertile soil, with ample moisture. Dietes butcheriana is not nearly as fast growing as the other species of Dietes. 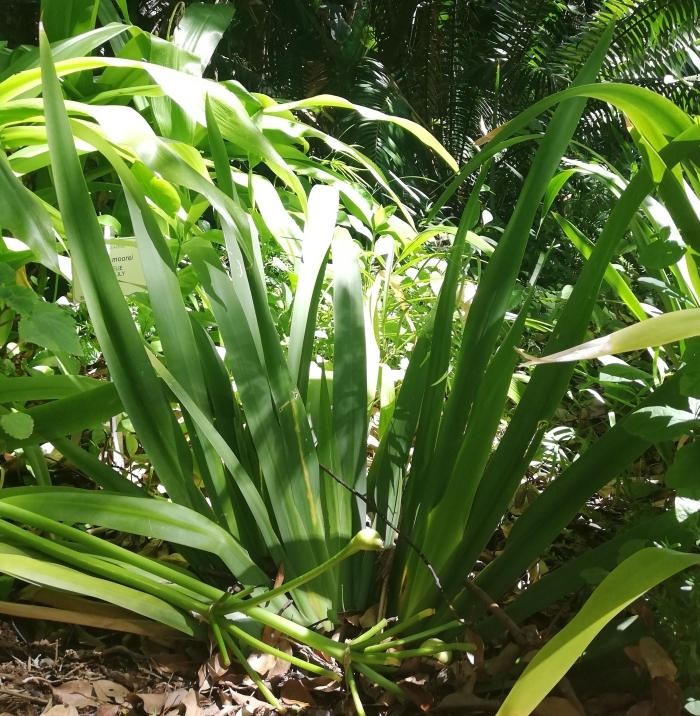 It grows well in deep shade under trees, as well as in partially shaded conditions, best in a fertile, well-drained, loam soil with adequate moisture. Its evergreen, clump-forming habit makes it suitable for use as a long-lived ground cover. Established plants are able to withstand periods of summer drought, provided they have sufficient shade, but ideally should receive watering at least once per month, during the height of summer. Dietes butcheriana can be propagated by dividing the rhizomes of large clumps in late autumn or early spring, and replanting immediately. Allow clumps to grow for at least 5 or 6 years before dividing. Sow seed in spring or summer in a good seedling medium and keep moist and warm. Because of their very hard seed coats, germination is highly erratic and seeds may take up to 4 years to germinate, with best germination taking place during the fourth year. Duncan, G.D. 1993. Wild irises for the garden. Veld & Flora 79 (3): 74–76. Duncan, G. 2010. Grow bulbs. 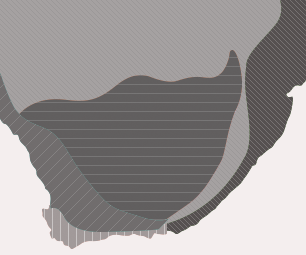 A guide to the cultivation of bulbs of South Africa and neighboring countries. Kirstenbosch Gardening Series. South African National Biodiversity Institute, Cape Town. Hulme, M.M. 1954. Wild flowers of Natal. Shuter & Shooter, Pietermaritzburg. Manning, J. 2002. Personal communication via email. Compton Herbarium, National Botanical Institute, Cape Town. Pooley, E. 1998. A field guide to wild flowers Kwazulu-Natal and the eastern region. Natal Flora Publications Trust, Durban. Victor, J.E. & Scott-Shaw, C.R. 2005. Dietes butcheriana Gerstner. National Assessment: Red List of South African plants version 2017.1. Accessed on 2019/01/08.